There's nothing I love more than sharing my kids' milestones. We all enjoy capturing photographs and other evidence of that first smile, the first tooth, first hair cut and those first steps. 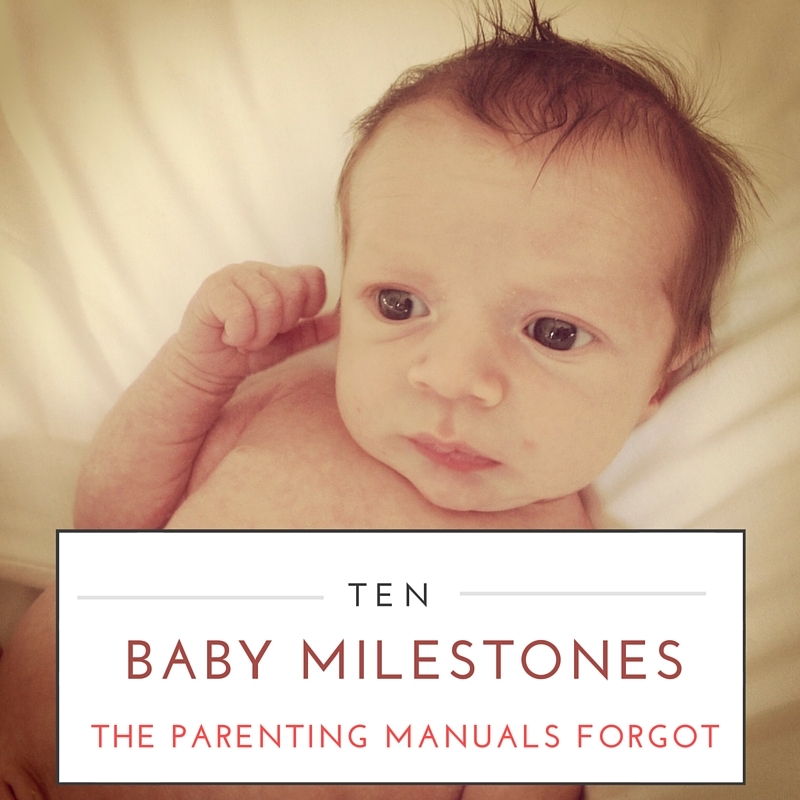 Within the first day, you may well encounter the first unexpected milestone: baby's ability to pee (usually straight into your face) as soon as you remove their nappy. Everyone enjoys an eyeful of urine. So cute! At around the same age, you may also experience the first projectile poo. If you're lucky, even if it bypasses the nappy completely, it will be contained by their clothes. But you may be unfortunate enough to be holding a naked baby when this happens, like poor Al Ferguson from thedadnetwork. There's no better sign that you need to cut baby's nails than when you are at the receiving end of a rake down the face when baby suddenly realises they can grab your nose. We spend weeks waiting for baby to start rolling. The novelty soon wears off when they like to perfect their technique as you change their nappy - the dirtier the nappy, the better! Bath time is always a lot of fun. But watch out for the first poo in the bath – usually when sharing their water with an older sibling who is drinking the bathwater from a watering can. Babies love practicing moving their arms and legs and after a few months, they will enjoy perfecting this skill with the octopus move as you attempt to dress them. Dressing your baby becomes a battle of wills as you each pit your wits against each other to encourage the correct limb into the correct clothing hole. Discovering their voice. It's fantastic when baby's soft gurgles start developing into babbling. What's less amusing is when baby discovers they can change pitch, especially when the preferred tone is extremely high pitched and very loud. At around 9 months as baby perfects the art of crawling, they also discover a radar that can identify an open stair gate and embark on a climbing expedition as soon as your head is turned. At around 10 months, baby may begin to stand while holding on to furniture. They soon discover that it is even more fun if they can stand and pull gently at a drawer and then toss out the neatly folded contents into a messy pile on the floor. Eye hand co-ordination is also developing fast at around this age and they quickly developing the ability to post things through a hole. This is great if it's the shape-sorter that is designed to encourage this skill, but it's not so fine when it's a biscuit being slotted into the DVD player. What less than joyful milestones have you encountered?